Just like picking a wedding dress, it can be incredibly hard to decide on one particular engagement ring style that best suits you. With so many options to choose from, from the ever-popular emerald-cut to ruby rings perfect for the stylish, unique brides, there's a lot to take into account before you pick The One. Sure, going a more nontraditional route is currently the trend taking over in wedding world (hello, black sparklers), but sometimes, you just can't help but stick with the classics—those designs that remain truly timeless, seasonless, and stunning. One particular diamond cut that falls into this category? Oval engagement rings. The shape is a true classic, though it still feels slightly more unique, chic, and eye-catching than a rounded gemstone—and we're certainly not the only ones who think so. In the celebrity and royal world, stars like Blake Lively, Kate Middleton, and Serena Williams are all rocking oval-cut engagement rings. The Duchess of Cambridge's bauble features a sapphire diamond, while Lively has an oval-shaped gemstone set atop an ultra-delicate band. Ahead, we rounded up 25 of the most breathtaking oval engagement rings on the market from some of our favorite brands, such as Brilliant Earth, Lafonn, Diamond Nexus, and more. And we made it even easier for you by dividing them by styles, including solitaire, bezel, and halo. This one's sure to dazzler all hours of the day. This one's so timeless and classic. 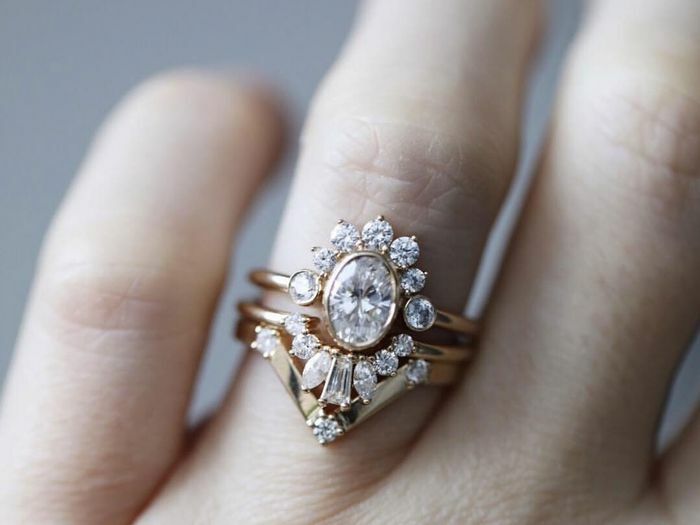 Next up, check out 26 stunning marquise engagement rings to buy now.